Der Spiegel says Israel and at least one other intelligence agency eavesdropped on telephone conversations during failed talks. The article said the Israelis and at least one other secret service listened in on Kerry's conversations as he tried to mediate, in a development that Der Spiegel said was likely to further strain ties between Israel and the United States. Spiegel, which cited "several sources among secret services", said that he used not only secure lines but also normal telephones with satellite connections which were vulnerable to tapping. "The government in Jerusalem used this information in the negotiations on a diplomatic solution in the Middle East," it said. Spiegel said Kerry's office and the Israeli government declined to comment on its report. 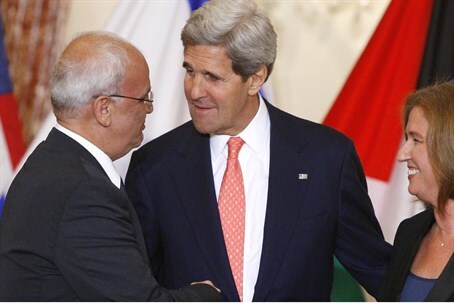 Kerry made reviving Middle East diplomacy a central priority at the start of his term and coaxed Israeli Prime Minister Binyamin Netanyahu and Palestinian Authority president Mahmoud Abbas back to the negotiating table in July 2013. But in April this year, Abbas broke the terms of the talks by applying for PA membership in 15 UN conventions and the peace drive eventually broke down amid mutual recriminations. Kerry has attempted to mediate during the current Israeli military operation in Gaza and flew to Israel last week.